16 years ago, a mixed martial arts baby was born in Indonesia, trying to crawl and learning to walk. Unfortunately, this baby’s steps were soon stopped in less than 3 years - early 2005. Though only briefly, the presence of this baby was able to awaken the martial arts world in this country. The hustle bustle of ambition, pride, and honor shook the heart of fighters coming from various parts of Indonesia. The baby was of course the TPI Fighting Championship – TPIFC, which first aired in June 2002. Since then the awareness towards mixed martial arts increased. Hundred of fighters and dojos tried to prove themselves on the TPIFC stage. In a way, TPIFC gave birth to many great fighters in each division such as Galih Suroso, Lili Uday, Andry Fachruriadi, Sunaryo, Linson Simanjuntak, Zuli Silawanto, Aji Susilo, Yohan Mulia Legowo and of course the undefeated, Fransino ‘the Pitbull’ Tirta. Fransino Tirta, who is now 37 years old, is the only undefeated MMA Indonesia fighter ever since his debut in 2004 (with MMA Record 16-0-1). Young Tirta started practicing traditional Jiu Jitsu under the guidance of Sensei Harmudianto in 2001. He also deepened his skill by learning free style wrestling with Surya Saputra, a SEA GAMES wrestling gold medalist. His grappling game went mad after meeting Prof Niko Han and the rest was history. He became unstoppable in TPIFC and won Djarum Super Submission Championship five times in a row. To sum it up, Tirta might be the best MMA fighter and grappler that Indonesia has ever seen. MMA Indonesia (MI) : 16 years have passed since the TPIFC era, how do you see the MMA’s development nowadays? It sure feels different, considering the fact that you were once a fighter and are now the number one man in OnePride. Fransino Tirta (FT) : MMA’s development has been remarkable since the existence of OnePride. Before OnePride, there was no MMA stage being regularly aired by national TV, so only a few people were aware of this sport. Everything has changed. When I was a fighter, there was no social media and UFC was not as big as it is today. OnePride fighters nowadays are very famous among the Indonesians, they are celebrities. MI : We have only been keeping up with OnePride since its third season, so we are still very curious as to how you got involved with the project. We also want to know the story behind PT. Merah Putih Berkibar. FT : It all started when I first met Pak Ardie Bakrie. We discussed about the development of MMA in Indonesia. How there was only a few fighters in Indonesia and the lack of achievements because there was no regular MMA events. He felt like it was his calling to set up a grand stage for MMA fighters in Indonesia to fight regularly. Pak Ardie Bakrie trusted and appointed me to go on with his vision with the help from TV One and all MMA Indonesia enthustiasts. Today we are very proud to have hundreds of fighter having a career in OnePride. OnePride also won the title of The Most Favorite Sport Program in 2017 in the 20th Panasonic Gobel Award. MI : How do you see OnePride in five years? We for sure hope it will still be around. This question may also be asked by fighters and MMA clubs that are training very intense to be in OnePride and have a career in MMA Indonesia. From what I heard a lot of fighters have qualified and yet they haven’t been invited to the showcase. FT : Looking at the trend - be it rating, sponsors, the numbers of audiences and their enthusiasm, as well as the fighters’ improvement, I am very optimistic that OnePride will always be around. Thousand of fighters show up at our auditions, however we are very restrained by the fight card quota, so we can only invite the best of the best. For those who haven’t been invited, please train harder. Try our regional MMA fight (in association with KOBI) or just come again at our audition to upgrade your score. It is the score, not the numbers of audition, that determines whom we invite to the show. MI : What are your thoughts about Brave MMA that was recently held? Does it give a positive impact, or do you see it as a threat for OnePride? FT : All MMA events outside the OnePride are not threat for OnePride. With the existance of other event, more stages are available for MMA fighters. More stages mean more MMA lovers which also mean more OnePride lovers. MI : A few years ago we heard a rumor that you were going to fight against Jens Pulver (a lightweight division UFC fighter), the rumor apparently stayed as rumor. Can you tell us what happened? FT : Well, that time I was offered to fight against Jens Pulver, a UFC champ. It was of course an honor for me to be able to fight against him. It was an opportunity I would never want to miss. The contract was signed and the tickets were sold out when the promoter suddenly canceled, just two weeks before the show with no reasonable explanation. It is still a mystery to me as well. MI : Apologies if this is quite sensitive, what happened during the fight between Suwardi and Rudy that you felt the need to issue an explanation in a video. Both of the fighters’ fans had their own opinion. Is there any chance we see the third Suwardi VS Rudy? MI : What are your thoughts on MMA fighters nowadays (especially in OnePride)? We’ve seen fighters disrespecting their opponents through trash talks, or fighters being picky with their opponents and even avoiding certain fighters. FT : As a promoter we provide the stage for fighters to explore, we have guidances and rules so the fight goes smooth, safe, and exciting. However, MMA is also en entertainment, so trash talk or disrespecting your opponents in terms of competing is one of the things that makes it even more exciting. Each fighter has their own strategies, we have fighters who are not afraid to fight against anyone and some other fighters who calculate which opponent they have a better chance with. As a promoter of course I will go with the brave fighters. The more picky fighters are usually not being prioritized. MI : Which OnePride battle do you think is the best battle? Why? Can you also name some fighters that you think have a huge potential to stick around in MMA Indonesia stage? FT : I have a lot of favorit fights. Every battle showcasing beautiful techniques and mental bravery of the fighters are the best of them. Of course the champions have huge potential to advance their career in OnePride. MI : We all know that KOBI is handling professional sports, but why did it join IMMAF which in fact is for amateur athletes? FT : Why not? When we met with the Minister of Sports, Bapak Imam Nahrawi, he ordered KOBI to go International -be it Pro or Amateur. MI : Do you think Indonesian fighters have a shot at UFC? FT : This is actually the best time for our fighters to get a spotlight at UFC. TvOne has bought the license for UFC programs and is trying to bring MMA to the center stage in Asia. In the future we will bring the best OnePride fighters to UFC. Just wait and see. MI : I will never get bored to ask if there is a possibility for you to come down and fight again. If it does happen, who wil be your opponent? How do you feel about a Fransino-Yohan rematch? FT : Hahaha... There is always a possibility, I haven’t officially retired. If I do decide to fight again, it may be against a fighter I have never fought before. MI : Last but not least, what do you want to say to MMA fans in Indonesia? FT : For MMA fans in Indonesia, keep supporting the fighters who have risked their career and safety to entertain the MMA fans, let’s build MMA Indonesia to the point where we can see them on the UFC stage. 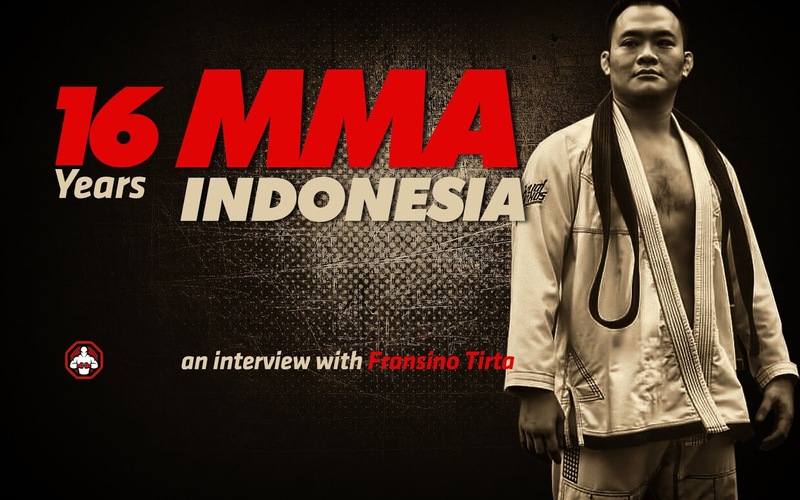 That concludes our interview with Fransino Tirta. We actually have more to ask such as his thoughts on OnePride fighters take home pay :), the possibilities of MMA event being held outside Jakarta, do KOBI and OnePride have any targets to get into PON, number of bouts for each contract, and some other controversial issues. This interview, however, is hopefully enough to answer MMA enthustiast’s questions out there. Thank you Fransino Tirta for taking the time! Good luck with OnePride MMA and the Pitbull Academy. Osu!